Health Care Review: Integrated Health Care — What Do Social Workers Contribute? Profound changes are taking place in how the United States delivers health care, and with social workers making up a significant part of the health care sector, we as a profession need to understand and adapt to these reforms. One key shift is moving from the traditionally siloed care that segregated physical health, mental health, and substance use disorders to delivering integrated health care (Stanhope & Straussner, 2018). This is a vital strategy in overcoming the fragmentation inherent in our system that is both costly and ineffective and in achieving what has been termed the "Triple Aim": improving the quality of care, improving the health of all the population, and reducing health care costs. In fact, integrating care can achieve what seems counterintuitive—saving billions of dollars while improving the quality of health care. Despite ongoing efforts by our current president and Congress to undermine the Affordable Care Act (ACA), many of the provisions of this act, particularly a focus on integrative health, are still standing. It is worth noting that steps to integrate care were well underway before the ACA was passed, and, arguably, whatever the fate of this legislation over the course of the Trump administration, it will continue to meet the needs of the American public. The shifting health care landscape presents both an opportunity and a challenge for social work. In many ways, health care reform represents a shift from what we have, which is a "sick care system," to a genuine "health care system" that treats people holistically, provides ongoing rather than episodic care calibrated to people's needs, promotes wellness, and seeks to address the social determinants of health. But while this is a big shift for the health care system that traditionally has been based upon an acute care model, these reforms are congruent with social work values, approaches, and perspectives, and it is time to appreciate the important roles that social workers can and do play in this time of change. This is good news for the more than 300,000 social workers employed in health and behavioral health settings (Stanhope & Straussner, pp. 215-236), as this focus on integrated health care represents a major opportunity for social workers not only to contribute but also to lead. But to do this we must be able to translate our strengths to the new environment. • Person-in-Environment Perspective. Social workers learn the value of an ecological approach in which a person's well-being and health care decisions must be understood in the larger context of their lives, including their families, communities, and cultures. This includes what has been termed "social determinants of health," a public health approach that basically refers to any nonmedical factors that impact a person's health (Stanhope & Straussner, pp. 3-20). Such an approach was exemplified in Atul Gawande, MD, MPH's ground-breaking New Yorker article "The Hot Spotters" published in 2011 (see www.newyorker.com/news/news-desk/atul-gawande-on-the-super-utilizers), which discussed how sometimes simple interventions, such as having a social worker and a nurse practitioner make home visits and phone calls to individuals with extensive hospitalizations and emergency department visits and helping them fill out needed paperwork, encourage use of medication, and other brief interventions, had a dramatic impact on the person's ability to maintain their health, and a "revolutionary" reduction in health care costs. Helping clients from a systemic perspective, including the ability to collaborate with other professionals, make social workers the ideal professionals to create partnerships with individuals, families, and communities in order to carry out cost-effective interventions that focus on prevention and wellness management—important components of integrative health care. • Valuing Social Justice. Social work is unique among the health care professions in that it has an explicit social justice commitment—it is social workers' mission to address inequities based on race, ethnicity, class, sexual orientation, and disability. Therefore, the profession focuses on social disparities, including health disparities, and tries to create a culturally responsive health care system to address these issues. It also includes addressing the stigmas that are a frequent component of some of the critical physical and behavioral health problems affecting our clients, such as HIV/AIDS, substance use disorders, and severe mental health issues. • The Importance of Self-Determination. Ensuring that people can make health care choices that are meaningful to them is not only the right thing to do, but also has been shown to promote greater engagement in services. In integrated care this is captured in the principle of person-centered care, which has marked an important shift from the traditional medical model where the physician makes all the decisions to the understanding that people are experts in their own care and that treatment plans must be the result of shared decision making. Person-centered care seems central to social workers, who have the needed skills in enhancing people's ability to make choices through education and empowerment. This approach plays a growing role in social workers' acceptance of the principles of harm reduction as part of the provisions of integrative health care, an approach that is increasingly recognized by other professions (Sieger, 2014). • The Importance of Interpersonal Relationships. That is the starting point in how social workers deliver care. With the growing focus on evidence-based practices, such as motivational interviewing, there is also a growing recognition of the role of interpersonal client-worker relationship that includes such important skills as how to engage and build trusting relationships with clients (Stanhope & Straussner, pp. 167-180). Furthermore, integrated care informed by the chronic care model and the development of patient-centered medical homes is recognizing the importance of interpersonal processes. It is an approach that is fully reliant on social interactions that start with the individual and their family—building a relationship to ensure that the person is "activated" to make decisions and take the lead in managing their wellness and establishing relationships among providers within teams, within networks, and across systems of care. Social workers are trained to be connectors and translators, communicating across cultures and systems. • Expertise in Behavioral Services. Over the past three decades, social work has become the largest profession working within community mental health and substance use disorder services, and consequently social workers have developed a deep expertise in these areas related to practice, research, and policy. 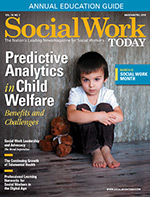 The education of social workers includes foundational courses on human behavior in the social environment, which equip students to understand human development, neuroscience, and mental health diagnosis and how these are shaped by social environments and inequities, while social work practice classes teach students key culturally relevant and evidence-based practices and family, community, and organizational dynamics. These areas of knowledge are applied in field learning where each social work student integrates the theoretical knowledge gained in the classroom to actual practice with individuals and families with behavioral health problems. Required courses about social policies make social workers capable of analyzing policies affecting their clients and of becoming effective advocates for needed changes on individual, community, and societal levels. Finally, courses on social science research help social work students become educated consumers on the latest behavioral problems and evidence-based services and motivate a growing number of social workers to go on for doctoral programs and work in research institutes where they learn to further contribute to improved integrated health care. Social workers are making significant contributions to integrated health care—it is time that their contributions to individuals and their families dealing with a multitude of physical and behavioral health problems, to other health care professions, and to society are fully recognized. — S. Lala Straussner, PhD, LCSW, is a professor and director of the post-Master's certificate program in the clinical approaches to addictions and the current the interim chair of the human behavior in the social environment area at New York University Silver School of Social Work. She is the founding editor of the Journal of Social Work Practice in the Addictions. The author would like to acknowledge the contribution of Victoria Stanhope, PhD, MSW, MA, to this publication. Much of this article is based on various chapters in Stanhope, V., & Straussner, S. L. A. (Eds.). (2018). Social work and integrated health care: From policy to practice and back. New York, NY: Oxford University Press. Sieger, B. (2014). The clinical practice of harm reduction psychotherapy. In S. L. A. Straussner (Ed. ), Clinical work with substance-abusing clients. 3rd edition. (pp. 165-178). New York, NY: Guilford Press. Stanhope, V., & Straussner, S. L. A. (Eds.). (2018). Social work and integrated health care: From policy to practice and back. New York, NY: Oxford University Press.